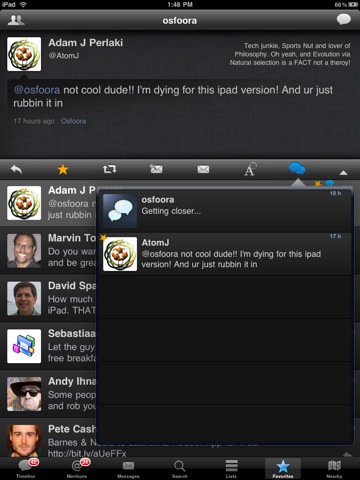 Osfoora HD for Twitter is a blazing fast and clean twitter client for your iPad. Provides elegant and easy access to all of Twitter's functionalities. Osfoora HD has all the features of Osfoora for iPhone and more. With a gorgeous user interface, multiple account support, optional full landscape mode (customizable), text expander, boxcar support, twitter lists, nearby tweets, and the ability to tweet songs... using twitter becomes a joy! ★ Multiple account support with easy management. ★ Full landscape support (Configurable). ★ Auto Refresh (1,2,3,4,5 minute intervals). Can be turned off. 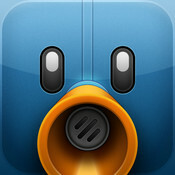 ★ Easily explore and manage your twitter timeline, mentions, messages, favorites, lists, saved searches, and more. ★ Informative timeline, indicates Retweets, Conversations, Faves, Images, own posts, read/unread all inline. ★ Advanced attachment manager, attach multiple photos at once to a single message. ★ Easy access to all your contacts. 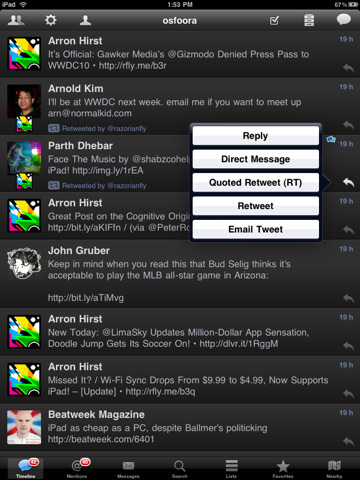 ★ Support for native retweets and normal RT mode. ★ Customize your twitter profile, change avatar, personal info. ★ Excellent user profile viewer, save and fully view profile images, user location on Map, more. ★ Add/Remove users to your own lists. ★ View your Retweets, Retweets of others, and your tweets that have been Retweeted. ★ View Geotagged tweets, also GeoTag your own tweets. 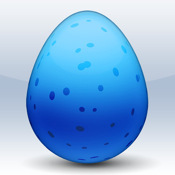 ★ View/Save/Remove Search terms with synchronization to twitter. ★ Nearby Search, Map View. ★ Search for users on Twitter. ★ Seamless Instapaper/Read It Later integration. ★ Url shortnening with bitly and tinyURL. ★ Support for custom bitly logins and API keys. ★ Upload photos with yfrog, twitpic, img.ly, tweetphoto, and Posterous. ★ See Conversations between friends. 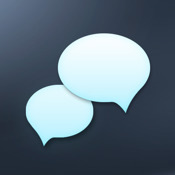 ★ Direct messages with Conversation support. ★ InApp browser, email, image viewer. ★ Delete tweets, Block users, report as Spam. ★ Customize Font size, refresh rate. ★ No missing any tweets, via gap detection. ★ Email and Save images. - Fix for loading older user mentions.